The COMESA Monetary Institute (CMI) in collaboration with IMF’s Regional Technical Assistance Centers for Eastern and Southern Africa (AFRITACs East and South), conducted training on “Enhancements to the Basel Process in view of recent developments relating to Basel II & Basel III” for central bank and bank supervisory agency officials. Participants who attended the training came from Burundi, DR Congo, Egypt, Djibouti, Ethiopia, Kenya, Mauritius, Malawi, Rwanda, Seychelles, Sudan, Swaziland, Uganda, Zambia, and Zimbabwe. 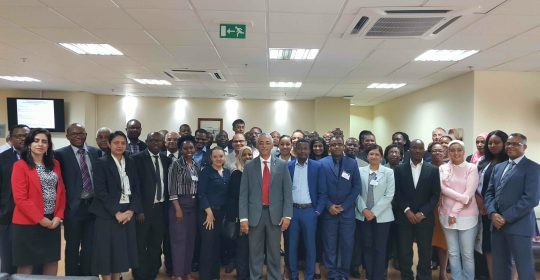 The workshop was held in Mauritius from 21st to 25th August 2017, following a decision by the 22nd Meeting of the COMESA Committee of Governors of Central Banks held in Bujumbura, Burundi in March 2017. The objective of the training was to enhance understanding of Basel II and III Accords, which are Basel Committee recommendations on Bank Supervision and Regulation. These Accords were designed to improve the quality of banking supervision and regulation worldwide and to enhance safety and soundness of financial institutions. The Accords have been helpful in terms of harmonizing banking supervision, regulation, and capital adequacy standards across international financial system through qualitative and technical tools. Unlike in Basel I accord which set a minimum capital requirement, and accounts for market risks in banks’ trading books for internationally active banks, Basel II has introduced three mutually reinforcing Pillars: capital requirement, supervisory review, and market discipline. The first pillar represents significant strengthening of the minimum requirements of Basel I, to ensure that capital allocation is more risk sensitive by introducing operational risks. The second pillar seeks to separate the operational risk from credit risk; while the third pillar aligns economic and regulatory capital more closely to reduce the scope for regulatory arbitrage. The event was officially opened by Mr. Rameswurlall Basant Roi, Governor, Bank of Mauritius who pointed out that regulation and supervision of financial institutions have become complex due to increased financial flows across banks and countries, requiring banks to build capital buffers to mitigates against potential losses, prevent bank failures and forestall boom and busts cycles. Director of the COMESA Monetary Institute (CMI), Ibrahim Zeidy, pointed out that implementations of Basel Accords were means to promote broad financial stability. Mr Zeidy warned that the implementation of the Accords is very complex in nature and require Central Banks and all financial institutions to aggressively build capacity of their staff, enhance their IT system and maintain comprehensive data base to ensure that better risk management is adopted in the financial system.